I have now been using Boat Beacon in the southern California waters for the past few months and really enjoy the visibility it provides me. Just this past weekend, my Yacht Club had a large cruise over the 4th in Catalina and in my trip over, I had a cargo ship that, based on Boat Beacon CPA data, going to get really close. I called the ship, by name, on VHF Channel 16 and based on the conversation, he changed course, which again we had a conversation with him telling me what he had planned to do etc. It is exactly that type of data that made my trip along with a lot of others. My question is; I have an assigned MMSI and Transmitting from the iPad, I “see” the ships, do they “see” me on their shipboard system? 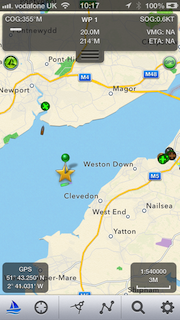 I know I can be seen on ship finder, Marine Traffic, but not sure if they see me in real time on their system. BTW; a number of my club members who were in transit had heard my call and discussion and came away impressed with what Boat Beacon can do. A number of them have already downloaded it onto their apple IOS and Android devices. In answer to Ken’s question, if you are only transmitting your position using Boat Beacon then the ships will not be able to see you on their VHF AIS Systems. However many of the Coast Guard stations and Harbour/Port Authorities around the US, UK and Australia do now combine internet AIS feeds with their local VHF AIS data, so there is a good chance you will be showing up on their screens. We were recently asked by someone who uses SeaNav for fishing trips if there is a way of adding locations/points of interest (POI) so they could mark their favourite fishing areas whilst at home and then navigate to them when on their boat. There is; though it might not seem obvious at first. You can use Routes and Waypoints with just one waypoint. Talking with Matt and trying to explain how to add waypoints and routes it also became clear that it is not simple to the un-initiated. So we are following up with some more detailed instructions. 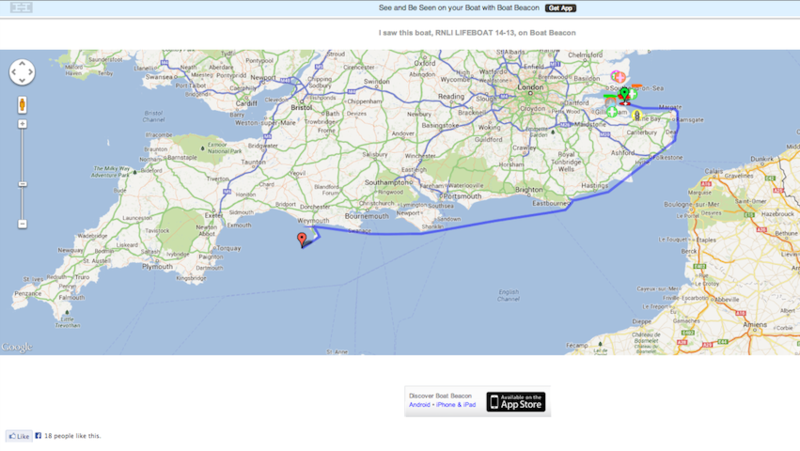 To add a new route you need to make sure the Sailing icon bottom left is not selected (must be gray rather than blue). You cannot create or edit a route if you are in sailing/navigation mode. To create a route tap the route button, middle of the row of icons at the bottom. Select “New route” from the popup by tapping the button. Then tap and hold for about a second anywhere on the map to put down a waypoint/marker. Don’t worry about being precise, you can drag and drop the pin by placing and holding your finger over it , to where you want it. If you quickly tap the pin a popup will display its name (WP1) and Lat and Long with a red cross to delete it on the left (you can’t delete it if its the only pin – you can delete its route later). Tap the blue arrow on the right of the popup to change the name of the marker. You can also edit the name of the route by tapping in the name box at the bottom where it says “Route1”. When you are done setting up your marker, tap Done, bottom right and you now have a route set up. You can of course add as many waypoints/markers to a route as you wish and you can add as many routes as you wish. After tapping Done this route will now be your active route. Tapping the route button again will let you add another route or edit your existing ones including selecting a route if you have many set up. When you have a route selected and displayed and then tap the Sailing button, SeaNav will enter navigation mode and show the name, distance, bearing, Cross track error (arrow at the top on the left pointing which way to steer to get back on track and how far off direct track you are), velocity made good towards the waypoint (VMG) and Estimated Time of arrival (ETA) to the closest Waypoint/Marker as well as your course (COG) and speed (SOG), updating it in real time as you navigate. SeaNav will also sound an alert when you get close to a Marker. Wales, UK – Pocket Mariner’s recently launched SeaNav app, with versions for both the US and UK/Ireland, has been updated to offer a more complete charting and navigation toolkit for boaters. To improve navigation and collision avoidance when out of reach of cell phone coverage, SeaNav — together with Pocket Mariner’s Boat Beacon app — can now also use on-board live VHF AIS data feeds. The app also now enables sailors to jump directly to specific locations using latitude and longitude searches and has been extended for use on iPods as well as iPhone and iPad. SeaNav was designed to enable boaters to explore, plan and navigate their boating trips in real-time and high-resolution using the latest up to date Digital Vector Marine charts covering the US coastlines and Great Lakes or the UK and Ireland. Pocket Mariner has successfully completed sea trials of the new local AIS feature with Lowrance, Simrad and B&G’s GoFree™ wireless systems, as well as with easyAIS and Digital Yacht. SeaNav works best when paired with Pocket Mariner’s Boat Beacon, which has become an enormously popular app among sailors for its simple-to-use location sharing and real-time “Map View” of both the user’s and other nearby boats via AIS. 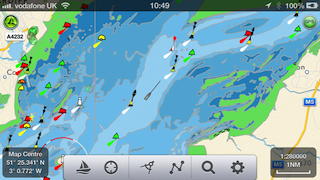 Together, SeaNav and Boat Beacon provide a powerful set of charting, navigation and location-sharing tools. 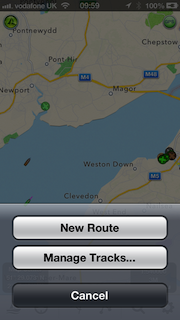 While Boat Beacon provides SeaNav with its AIS data and alarms, Boat Beacon gets marine charts and routes from SeaNav. The two apps share hot-jump buttons that ensure they are both on the same location and at the same zoom level on the map. • Route Planning and real time tracking including Waypoints, SOG, COG, ETA, CTE etc. 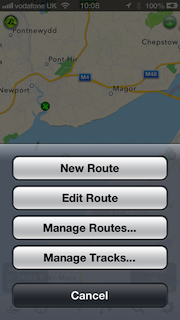 • Route and Track export, import and sharing. • Charts downloaded and stored on device so they work without mobile coverage! • Seamless fast panning and zooming across charts. 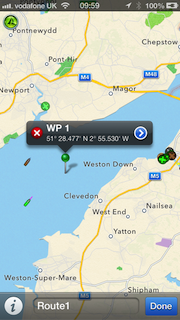 • Live AIS Ship positions overlaid from Pocket Mariner’s Boat Beacon app. • Configurable layers; buoys, lights, depths, rocks, wrecks, anchorage areas etc. SeaNav has two versions, SeaNav US which uses NOAA charts providing complete coverage of USA and Great Lakes and free chart updates for life. SeaNav UK uses UKHO Admiralty charts and includes the complete set of charts for the UK and Ireland plus a year of free chart updates in the one-off price. New versions of the app with charts for other countries and regions are in the works. Both versions are available from the App Store for iPhone, iPad, and – in this latest version – on an iPod touch, for US$9.99 and £9.99 in the UK. View of the blue target (Ferry) from bridge of our boat.